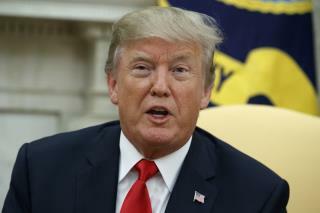 (Newser) – "It's frankly disgusting the way the press is able to write whatever they want to write," President Trump told reporters at the White House on Wednesday. "And people should look into it." Trump, speaking hours after he tweeted about challenging the licenses of "NBC and the networks" for producing "fake news," said he was calling for more honesty, not limits on the media, but he later doubled down on his threat to challenge licenses, Bloomberg reports. "Network news has become so partisan, distorted, and fake that licenses must be challenged and, if appropriate, revoked," he tweeted. "Not fair to public!" Hitler got rid of anything HE didn't like, too. But, what else can you expect from a man-child who keeps a book of Hitler's speeches on his nightstand? the 1st amendment doesn't allow shouting "fire" in a movie theater when there is no fire but this is a favorite technique of the media. If President Forrest Trump really wants to destroy 'fake news,' then the clown should start at Newser, take an ultra-right-wing turn at Breitbart and drive his 'righteous truthiness' tractor right through the Fox Fake News set. That would only be a start.